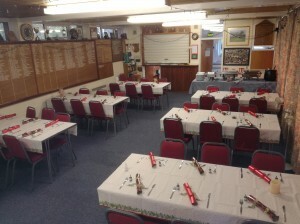 Thank you for visiting the Farnborough Bowling Club Website. Use the menu at the top of the screen to navigate around the site or select a post to view from the left. The club laid a new green in September 2016 ready for our 70th anniversary year. Free lawn bowls coaching – Rushmoor Borough Council. Oh what a night, mid December, the twinkling lights, the decorations, the music, the ambience, the food and, of course, this would not have happened without the 34 people who braved the weather and attended. Sue Foden – Sue’s ice breaker quizzes – if you couldn’t remember “old money” you were in trouble? Wrong curtain – two men arrive to measure up for new curtains? They caused mayhem, disruption and chaos in the process of their “measuring” Silly men, it turned out they should have been at Farnborough Gate – we told them it was curtains for Farnborough Gate and sent them packing! Lynne Gregg – Lynne very eloquently read out some very amusing poems – if you want to know what to do with your old knickers – ask Lynne? Brenda, Katherine and Cindy – a table, a pot of tea, two ladies chatting (Brenda and Katherine), a misunderstanding, poor Ma (Cindy) (in her 70’s) is not in the family way, she is in the way of the family, a brilliant and very funny play on words. Pam – pass the parcel – no music, Pam read out a tale about the Left and Right families! Some people don’t know their left from their right! Arfer’s easy peassy quiz – a, b or c, it was simple for some? Lynne Gregg won but donated half of the fruit basket (which was massive) to the winner of Last Man Standing who was Alan Brooke. Money for nothin’ and chips for free - Jess and Molly accompanied by Alan – words you thought you may have heard in a song? Poo was mentioned. Very clever and amusing. Chris and Amanda Wright – the 12 days of Christmas – Edwards keeps sending Emily presents – can you imagine all those birds, animals and people in your back garden, Emily issues Edward with an injunction from her solicitor, A. Creep. Bet she kept the gold rings? SPAM – Two Soups – venue Rumbling Tum, Farnborough’s finest bistro – a couple in a hurry, a deaf waiter, small wine glasses and soup all over the floor – what more is there to say!